This is a lovely morning in my home town! The air is gentle, not damp, and comfortably cool. Sunbeams push through the the slowly morphing scarlet, rust and tarnished gold of the trees on my path. My senses are heightened by this simple yet elegant beauty and I feel alive and awake in a way that has eluded me for a few weeks. I want to take in every leaf, every sound, every drop of dew but I cannot–it is too much! 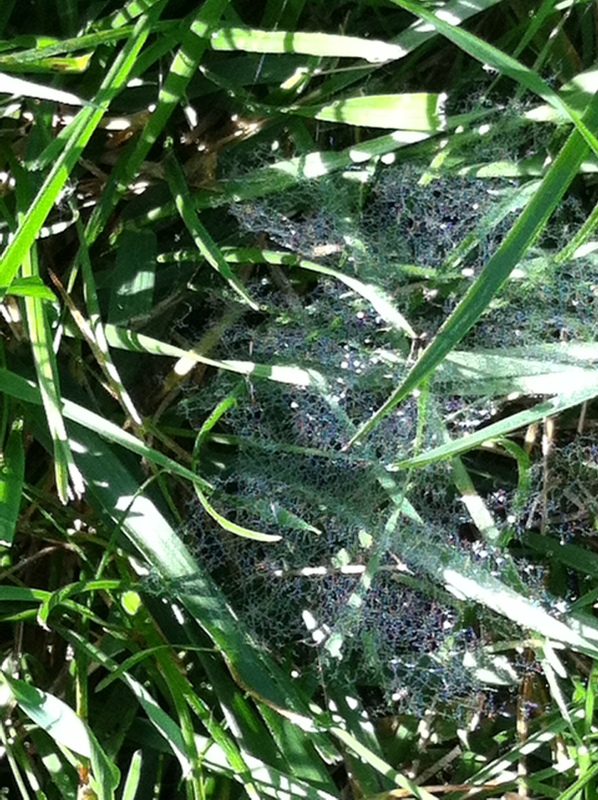 Instead, my eyes drop to the grass and I am blessed with the singular loveliness of a dew wrapped spider web. This web reminds me of lace, but it is unlike the usual suspects one normally encounters. It graces the grass blades in an un-presuming manner, daring me to touch it, but I can not, will not take the horrible chance of adulterating its pristine and delicate design. This lace brings me to ponder the clothing we are seeing and wearing this season. Many variations of leather, lace, denim and hard suitings abound. The combination and dichotomy of these materials is exciting. What does this textile melange say to us? To me? Who would suspect that this little web of dew draped lace would be key to an early morning self insight of how I choose to clothe myself?